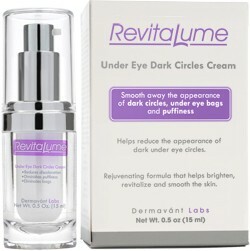 Fade Away Dark Under-Eye Circles With RevitaLume. The reason for under-eye circles and puffiness isn't a lack of sleep. Actually, dark under-eye circles originate from minute quantities of fluid seepage beneath your skin. When your body breaks down this fluid, the unfortunate side-effect is visible, bruised-looking circles below your eyes. This process occurs constantly throughout your body but is significantly more noticeable in the delicate, translucent skin underneath your eyes. RevitaLume addresses the root cause of under-eye circles to do more than just conceal them; RevitaLume works to repair the damage and prevent future dark circles from forming. Gently clean and dry your skin prior to use. Apply RevitaLume twice daily: once each morning and again prior to going to sleep at night. RevitaLume is extremely concentrated and should be applied sparingly. Put just one drop of RevitaLume on your fingertip. Lightly tap the affected area under and surrounding your eyes where puffiness or discoloration occurs. Keep on tapping the affected skin gently until RevitaLume has been absorbed completely. Be careful not to get any in your eyes. RevitaLume penetrates your skin instantly, with visible results appearing within only a few minutes. Hesperidin methyl chalcone is a flavonoid compound produced by citrus fruits. This compound reinforces your capillary walls to reduce fluid leakage, preventing future dark circles from forming. Additionally, hesperidin works as a powerful antioxidant to prevent and reverse damage caused by free radicals. Chrysin is a potent bioflavonoid extracted from passion flowers. Chrysin is proven to stimulate an anti-inflammatory effect, which significantly diminishes the appearance of dark circles. This anti-inflammatory response is caused in part by powerful vasodilation. Palmitoyl tetrapeptide and palmitoyl oligopeptide are synthetic collagen fragments. These peptide molecules penetrate to the deep subcutaneous layers of your skin to stimulate your body's natural collagen production. This increased collagen production smoothes out fine lines and wrinkles to improve your skin's texture. Retinyl Palmitate is a potent Vitamin A-derivative which stimulates cellular growth and improves your skin's health. This results in smoother skin, thicker skin which is less prone to puffiness and dark circles. Shea butter is a powerful skin moisturizer with unique therapeutic properties. On top of rehydrating your skin, shea butter also reduces swelling and inflammation to reduce under-eye puffiness. Cucumbers have always been regarded for their capacity to soothe and soften skin. Cucumber extract is highly potent and effectively diminishes under-eye puffiness and soothes the surrounding skin. RevitaLume works fast - many people observe a noticeable difference in their dark under-eye circles within minutes. Fade away your dark circles with RevitaLume.